"Sky Striker Ace - Raye" in the artwork of "Sky Striker Mobilize - Engage!" "Sky Striker" (閃（せん）刀（とう） Sentō, literally "Flash Sword") is an archetype of female monsters and Spell Cards that debuted in Deck Build Pack: Dark Savers (in the OCG) and Dark Saviors (in the TCG). Sword Maneuvers, sally forth!! ERADICATE 'EM!! In order to fight against a powerful enemy nation, a new type of weapon, "Sky Striker Mecha", was developed using advanced military tech. 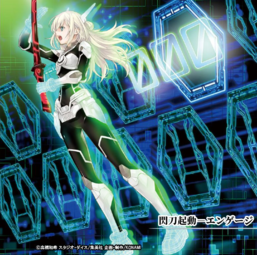 The sword "Sky Striker", the ignition device for these weapons, was entrusted to the girl "Raye". To protect the people of her homeland, she flies solo into the heart of the enemy forces!! "Raye", the girl trained to defeat a powerful nation!! By activating the power of Sky Striker, she can open special gates, and from there launch an assault with the "Sky Striker Mecha". Meet any and all battle conditions! Sky Striker Mode Change!! "Raye" opens the gates with Sky Striker at maximum output, changing into a decisive battle mode to fit the situation. She mows down her enemies with overwhelming firepower!! A defense-based mode. It can generate barriers to prevent all attacks. An enemy force eradication mode. It is said that none who look upon her in this form return alive. Finishing Sky Striker Maneuver Activate!! Each of the "Sky Striker" Spells are armaments that "Sky Striker Ace - Raye" utilizes. The Link Monsters of the archetype are "Raye" wearing elemental powered armor. Each monster and Spell depicting an equipment seems to have a code written somewhere over it. The Japanese name of the archetype is a multiple-layer wordplay. The kanji 「閃（せん）」 (Sen) can mean "flash", but is also the basis of the verb 「閃（ひらめ）かす」 (Hiramekasu), which means "to brandish", tying onto the following kanji "sword". Together, they form a homophone for 「戦（せん）闘（とう）」(Sentō) "battle", referencing the apparent status of "Raye" as an elite soldier. The sub-archetype "Sky Striker Ace" adds the kanji 「姫（き）」 (Ki) at the end. It usually means "princess", or an otherwise young lady of noble birth. This forms a second homophone itself, this time with 「戦（せん）闘（とう）機（き）」 (Sentōki), meaning "Fighter aircraft". This might be a quip on how a flight-capable powered armor can be considered equivalent to such a plane. The official description of Dark Saviors somewhat acknowledges the pun with the remark "Her high-tech arsenal includes transforming power armor that lets her fly faster than a fighter jet". Lastly, "Sky Striker Ace" monsters are named after the Japanese name of things that relate to their Attribute: the "Kagari" means "bonfire", "Shizuku" means "droplet", and "Hayate" means "gale". "Raye" is a French-like alteration of "Rei", which means "zero" or "nought", referencing both the DARK Attribute and her being the armor-less basic form. The Link Monsters "Sky Striker Ace - Kagari" and "Sky Striker Ace - Shizuku" strengthen themselves through the use of having multiple Spell Cards in the GY. "Kagari" gains ATK for every Spell Card in the GY, while "Shizuku" lowers the opposing monsters' ATK for every Spell Card in the GY. "Hayate" does not manipulate ATK; but instead can attack directly. They also all share an effect to manipulate "Sky Striker" Spell Cards; "Kagari" can add one from the GY to the hand when Summoned; "Shizuku" can add one from the Deck to the hand during the End Phase of the turn it was Summoned; and "Hayate" can send one from the Deck to the GY when it inflicts battle damage. The "Sky Striker" Spell Cards all share the activation requirement that there must be no monsters in the Main Monster Zone to activate, except "Sky Striker Mecha Modules - Multirole" and "Sky Striker Airspace - Area Zero". In addition, each "Sky Striker" Spell Card has an extra effect when there are 3 or more Spell Cards in the GY, varying from additional card destruction ("Sky Striker Maneuver - Afterburners!" and "Sky Striker Maneuver - Jamming Waves!") to hand and/or field advantage ("Sky Striker Mobilize - Engage!" and "Sky Striker Mecha - Widow Anchor"). Sky Striker Maneuver - Jamming Waves! "Sky Striker" Decks focus heavily on Spell Cards, allowing cards like "Imperial Order", "Secret Village of the Spellcasters" and "Anti-Spell Fragrance" to slow down the Deck. "Cursed Seal of the Forbidden Spell" and "Spell Vanishing" can be particularly potent if used against "Sky Striker Mobilize - Engage!" or "Sky Striker Mecha - Hornet Drones". Due to their fairly low ATK, the individual "Sky Striker Ace" monsters are easily defeated if their Spell support can be countered. Anti-searching effects can be potent, though the effects of "Kagiri" and "Hayate" can get around this.